Fly around with purpose and ease with this durable and delightful Atlantic puffin tote bag! Groceries or college books, this bag can carry just about anything with handles long enough to be worn over the shoulder. Printed in black, blue and orange, this tote bag is made from 10oz unbleached canvas and has been printed on both sides. 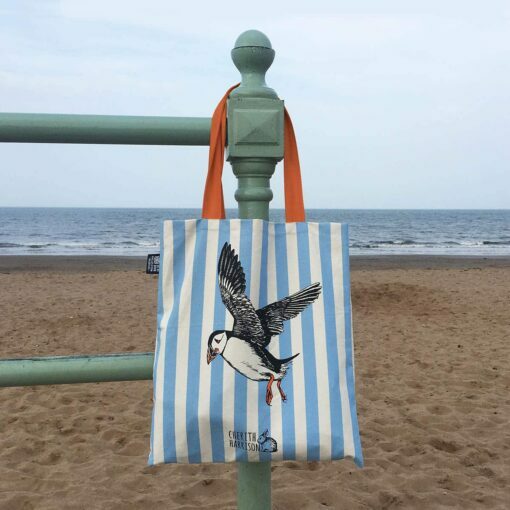 One side of the bag features a flying puffin with nautical blue stripes and the other side shows a standing puffin with a fun geometric pattern printed in the background – a quirky and contemporary twist to a traditionally illustrative design. Finishing off the bag perfectly are bright orange over-the-shoulder handles. Made in the UK, this bag measures 38cm x 43cm and is machine washable (40°C max) – we advise that you turn the bag inside out before washing.